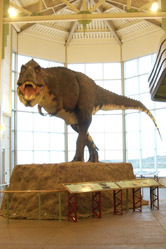 Tyrannosaurus Rex: T. Rex stood 20 feet high and 48 feet long. Its teeth had been found in the late 19th century but a more complete skeleton was found in 1902. Its head was five feet long. It had teeth seven inches long, or about the length of a new pencil. If it lived today, T. Rex could swallow human beings whole. Albertosaurus: This Cretaceous meat-eater was 30 feet long and looked a lot like a smaller Tyrannosaurus Rex. Avaceratops: In 1981, scientists digging in Montana found bones of this Cretaceous creature with one short horn, a round plate like a fan around the head, and a beak-like snout. It looked a lot like the more famous Triceratops but with only one horn. Deinonychus: The fossils of a meat-eater similar to Velociraptor, but much larger, were found in Montana in the 1960s. Deinonychus had strong, grasping fingers sharp teeth, and a large ripping claw on each foot to bring down the animals it ate. To stand on one foot while attacking with its claw, this dinosaur probably had to be quick. Some scientists think this is evidence that dinosaurs were warm-blooded and fast like humans, not cold-blooded and sluggish like reptiles. Deinonychus was about ten to thirteen feet long and a little shorter than an average adult human. Purgatorius: These little animals looked like squirrels, but were distant ancestors of humans and apes. It lived during the Cretaceous and the Paleocene, which means that it lived at the same time as the last dinosaurs and survived whatever killed them. It was about 9 inches long and fed on fruit, small animals, and insects. 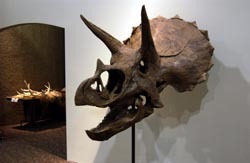 Triceratops: The first fossils of Triceratops were uncovered in the 1880s. It had three horns, one on the nose and two over its eyes. Triceratops had a beak-like mouth and a frilled ridge over its neck like a fan stuck to its head. It was about 30 feet long and was another Cretaceous dinosaur. Troodon: Scientists have found bits and pieces of Troodon since 1856. It was a small meat-eater that probably had large slashing claws like its bigger relative, Velociraptor and the much larger Deinonychus.